Phoenix thought that sticking a V8 engine in the 75 and developing an entirely new floorpan for it was a good idea for a range-topper. Is this the ultimate Q-Car? Who’s going to be able to spot this as the 256bhp (or 260PS – hence the name) ZT V8 instead of one of the more sedate front wheel drive models? IT has to be said: you have to admire MG Rover for its bravery. The “Phoenix Four” have been been lambasted by many people in the press, who felt that John Towers and his co-directors have been into MG Rover for no other reason than to line their own pockets. This is, of course, a load of rubbish. Had they really wanted to do this, they would have kept things as they were, churning out Rovers for a couple of years before giving up and selling off Longbridge to IKEA, whilst patting themselves on the back for their ingenuity. As it was, they re-introduced the MG brandname to the mainstream, and announced a couple of ambitious plans. 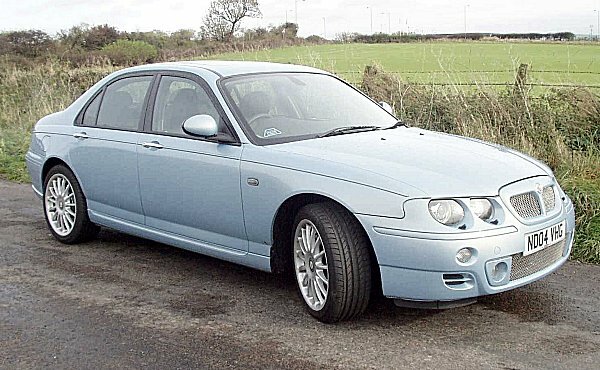 Both plans bore fruit in the early months of 2004 – one being the MG XPower SV, and the other was this: the V8 powered rear wheel drive Rover 75/MG ZT. The mid-range was always going to be a lot more complex, and it won’t be until 2006/2007 before we know whether these plans have been successful or not. And it does make you wonder what the boys at Longbridge were smoking when they thought up this one… I mean, the smooth and sophiticated 75 was – and is – a monumental achievement to what can be done with a stiff bodyshell, clever suspension and front wheel drive, but it does seem an odd base from which to build a powerful rear wheel drive sports saloon. Perhaps the decision to convert the 75 to RWD was taken by management or product planners, who didn’t really understand what was involved in such a plan, but whatever the process was that led to this car, it has proved to be something of a triumph of ingenuity over convention. If you look back in the company’s history, this kind of conversion has been undertaken before. When Spen King got hold of Harry Webster’s Triumph 1300, he decided that in order to make more money, it needed to be simpler. So the conversion was made: the posh front wheel drive Triumph 1300 became the cheap and cheerful rear wheel drive Toledo. Different reasons, different ambitions and a different time – but it had been done before. The project was given the code X12, and by late 2000, it was on the drawing board. As detailed elsewhere, the conversion was eventually farmed out to the famed rally car development company, Prodrive, and each engineering obstacle was tackled one by one. The most amusing thing about the rear wheel drive conversion has been that it has finally put paid to the tired old rumour that the 75 was based upon some retired BMW platform. You see, had the 75 been based on a rear wheel drive BMW, then the conversion would have been a lot more simple than it proved. Development dragged on, and due to the complexity of the task, Prodrive needed more and more money to overcome each problem. The most famous issue was the rear differential housing, which was far too small on the existing car. 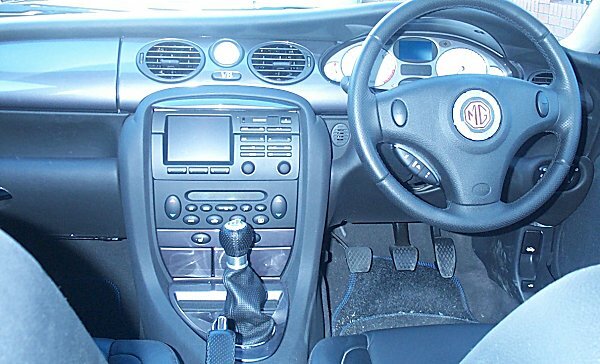 In the end, MG Rover called time on Prodrive and took the final development of the car in-house, leaving itself with a few final teething problems, but the majority of the work done. 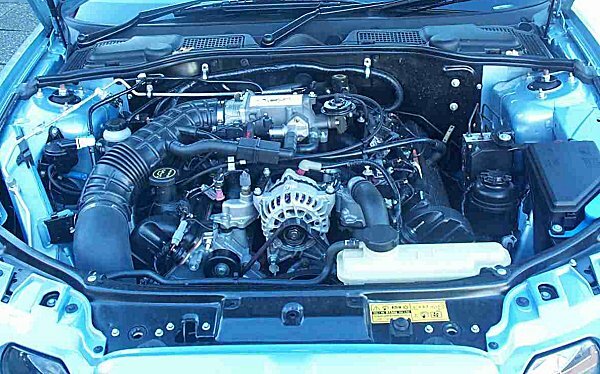 The engine choice was pretty straightforward, and although some commentators drew attention to the fact that the Qvale Mangusta and the X12 used Ford sourced V8s, there were significant differences between the two. The use of the 2-cam version of the Ford V8 in X12 was decided upon before the Qvale deal was started… and the Italians were using the 4-cam version anyway. 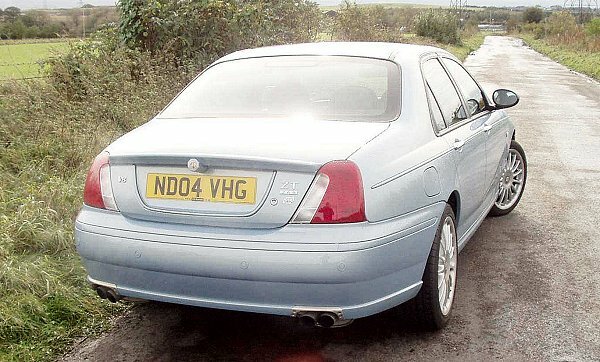 Development may have appeared to drag on far too long in the eyes of the press as well as MG Rover enthusiasts, but in the end, the longish gestation period appears to have been justified. In the end, X12 amounts to pretty much an entirely new floorpan, and one which has cost the company far more than it may have originally envisaged. But by the beginning of 2004, production ZT260 V8s started to dribble out of Longbridge, and MG enthusiasts had their first rear wheel drive V8 powered car to play with since that low-production special, the RV8. 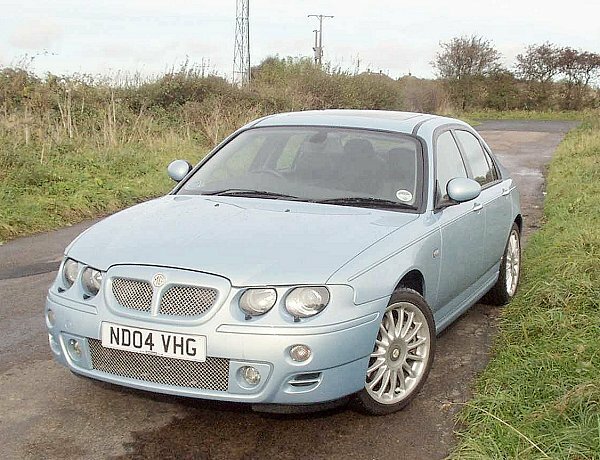 But what a car it has proven to be, and even the most hardened MG Rover cynic has found it difficult, nigh-on impossible, to criticise the ZT260. For one, it looks as good as any other ZT, and although some would say it is getting on a bit now, the basic shape is still in very fine fettle. The fact that the ZT is not dripping in chrome also seems to make it look more modern than its Rover sibling… the original quad-headlamp model is – on balance – a nicer looking car than the current version, and given the short interval between the intorduction of the ZT260 and its facelift, there are very few of these models around. No effort has been made to tidy up the V8 installation or disguise its origins, but that just adds to its honest and down to earth appeal in our eyes. It has to be said that the Mirage Silver paintwork (which looks blue to us) is an unusual choice on a ZT, but it does look fabulous. It makes a pleasant change compared with the more usual black, red or silver, but it looks classy and interesting. One of the major appeals of the ZT260 to us is its sheer Q-Car appeal – considering it packs such a punch, it looks almost identical to the more sedate V6 and four-cylinder versions. That means that you can make rapid progress in this car without attracting any attention from others… unless of course, they get close enough to hear that exhaust rumble. When you start up the car, you cannot help but be seduced by that melodious engine and exhaust note. The engine burbles away at idle in the most reassuring way, while the exhaust note constantly reminds you of the fact that you’ve bought into the V8 experience. A quick blip of the throttle is enough to excite the passions – the car rocks ever so slightly in unison with the rise and fall of revs. So, you are never going to forget that this is a V8, even at a standstill. Getting underway serves out a number of further reminders – the clutch is meaty and the throttle well weighted. Only deliberate pedal inputs are going to get you going, and this is nice, because it lends a high quality, precision engineered feel to the driving experience. Gear selection is also pretty “mechanical” – in a way that the German opposition seems to have dialled-out years ago. But do not be fooled – this impression of control weight never leads you to conclude that the car is agricultural or under-developed, as everything is so smooth. Once underway, the “positive” becomes an “overwhelming positive”, as the deep-chested shire horse of an engine begins to make its presence felt. There are no peaks and troughs in the power curve, and you soon become to appreciate the linear and elastic nature of an engine that pulls just as well at low revs as it does at the top of the rev range. OK, it is a slightly softened V8 sountrack that you are treated to in this car, lacking some of the hard edged urgency of the more sophisticated European V8s out there, but it is a very emotive engine, and one that had us heaping praise at the alter of the Motown powerhouse. “The V8 seems to be loosening up quite well now and the soundtrack to hard driving is just sublime. In fact, the soundtrack to any sort of driving is excellent. Even doing a steady 60 in fifth, you can hear those 4 exhaust pipes burbling away behind you. Normally I leave a bit of a gap in front so I can squeeze the throttle and hear the burble change pitch (sad I know but I love it!). It is impossible to drive this car around town without getting looks from just about everyone walking along the pavement. It sounds like nothing else (save maybe a TVR). I know what he means about the performance: unlike most of the opposition, when you accelerate hard, you KNOW that you are accelerating hard. The engine tells you so… if anyone tries to convince you that this car is deceptive at speed, then they must be wearing headphones. But don’t get the impression that it is noisy, because it isn’t. It’s simply that you can hear every living pulse of that engine. And that has to be one of life’s biggest pleasures for a ZT260 owner. When I first drove this car earlier this year, the sum-up was that at long last we have ourselves a modern equivalent to the Rover SD1 Vitesse. I stand by this conclusion, but during the intervening months, I have come to appreciate this car’s subtlety. It is nowhere near as extrovert as the SD1 ever was, even though it is a sporting looking car, thanks to the MG regalia it carries. No, the SD1 was a car with intent… the equivalent of a suited and booted office worker walking around with a big stick to hit people with. People knew at first glance that the Vitesse was a car you needed to give way to. The ZT260’s qualities are slightly different, though – it’s sporting enough, but you don’t know how big a stick it is carrying until it has hit you over the head and stolen your dinner money. That makes it a devastating stealth weapon in the right hands. With thanks to John Hunton for the photos.